Ferrero Rocher would love to give away one prize pack ($18 value) to one lucky reader of The One Income Dollar. A random draw will be made by Random.org on December 5, 2014, from all Canadian entries received. Leave a comment for Ferrero Rocher and your email. Ferrero Rocher, I have loved you for as long as I can remember. However, just like the Caramilk secret, I gotta know, how do you get that yummy goodness in the middle of that delicious shell? I love Ferrero Rocher! They make wonderful gifts! 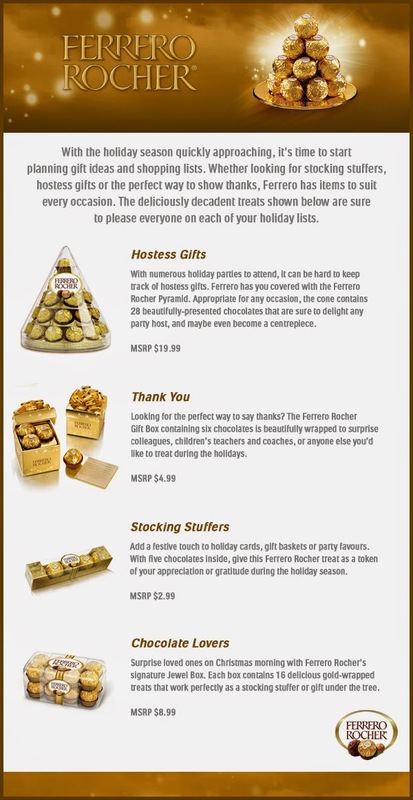 I love Ferrero Rocher all year long but the holiday packages are extra special! Thanks for the chance! We love Ferrero Rocher, always have to have it at Christmas time! Thanks for the chance. I think the idea of a Ferrero Rocher Pyramid is a fantastic idea for a hostess gift. Ferrero Rocher, you make my wife happy, which means you make me happy. Thanks! Ferrero Rocher, is always on my table for guests at Christmas time. They are delicious and really enjoy them. ohh yummy,Ferroro Rocher`s are my fav!!! I love ferrero rocher. Always have to have it on special occasions. Have you seen that pin for ferror rocher chocolate martini? omg. want. I love Ferrero Rocher. I always have them during the holiday season. I have been a fan of Ferrero Rocher since as long as I can remember. Christmas is not the same without Ferrero under the tree. We always celebrate Christmas with Ferrero Rocher chocolate, theres also always treats left in our stockings. I love Ferrero Rocher! Especially the creamy center filling and the crunchy outside. Its so delicious! Ferrero Rocher is a Christmas tradition in our home.